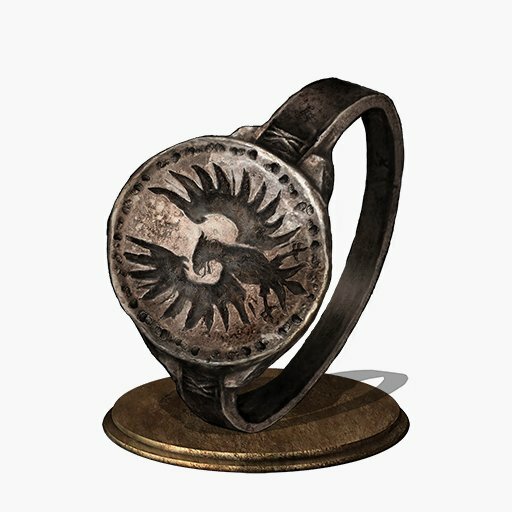 Ring associated with Hawkeye Gough, one of the Four Knights of Gwyn, the First Lord. Extends the range of arrows. In his later years, the giant Gough was blinded, but this did not prevent him from striking down a calamitous dragon with his Greatbow. Decreases the damage fall-off of throwing knives and similar consumables at long ranges. Changes the arc of firebombs and urns when thrown unlocked. Hawk Ring Extends the range of arrows. Dropped from the Giant in the Undead Settlement. Alternatively, it can be found on the dead body of the Giant on top of his tower after the player has looted all three white birches in the Undead Settlement, in Farron Keep and in the Cathedral of the Deep. * Dropped from the Giant in the Undead Settlement.